During the Cold War, the Soviets challenged the United States with the implied threat of nuclear warfare. Nonetheless, the United States and the Soviet Union were often treated by the U.S. media as moral equivalents. Why? At one point, the Soviets controlled a third of the world, yet government policy (in the pre-Reagan years) often adhered to media pressure to "get along" with the Moscow miscreants, seldom confronting their presumed right to enslave others forever. (The Cuban missile crisis was one of few exceptions.) Why is that? Though world communism has killed more than 100 million souls worldwide, one strains to find a single instance where communists are depicted by Hollywood as committing an atrocity. How come? Post-Cold war, much of the media, under pressure from "politically correct" sources some suspected as fronts for terrorists have over time excluded references to "radical Islamic terrorism" or even "war on terrorism," notwithstanding events of Sept. 11, 2001, and other treacheries. Why? 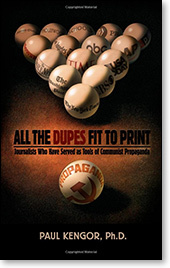 Anyone seeking to make sense of this 80-year disinformation fog might logically consult "All the Dupes Fit to Print: Journalists Who Have Served as Tools of Communist Propaganda." 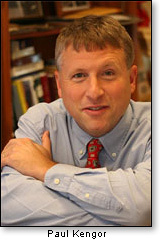 Author Paul Kengor describes a "dupe" in this case as one who is misled by communists and unwittingly does their work. Make no mistake, Mr. Kengor adds, the mainstream media over the years have included communists. Partly because of their outsized influence within the industry, media consumers have often been ill-served. The misled "dupes" do much of the heavy lifting. The author has pinpointed a key source for this approach on the part of those whose job is to keep us informed but who instead ignore the admonition "Know your enemy." Enter Curtis MacDougall (1903-1985), whom Mr. Kengor cites for his authorship starting in the 1930s of "Interpretative Reporting," a compendium that was periodically updated with new editions up until MacDougall died a half-century later. The "new journalism," MacDougall envisioned, "would be a biased form of journalism intended to reshape the world anew," a brave and better new world, a "progressive" one. 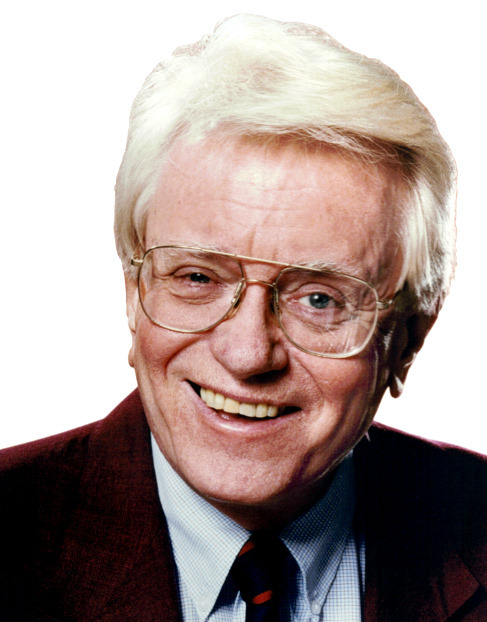 It is no exaggeration to say that if any one icon merited credit for influencing the tone of journalism throughout most of the 20th and into the 21st century, Curtis MacDougall would have to be considered for the dubious honor. He worked for United Press, several newspapers, taught for 29 years at Northwestern University and departed as he was working on the ninth edition of "Interpretative Reporting." "All the Dupes Fit to Print" names some career journalists who were influenced by or practitioners of the loosely labeled "new journalism" that helped lead to what is known today as "media bias." Two disciples of the MacDougall-style were Walter Duranty, honored to this day by The New York Times, though he used the pages of the "Gray Lady" to cover up Stalin's deliberately created famines in Ukraine, a mass murder that killed up to 10 million peasants, and Edgar Snow, whose writings were widely thought to be instrumental in creating worldwide sympathy for the Chinese Communists, leading to their ultimate takeover of the world's most populous nation. A chapter on the late Walter Cronkite is titled "And that's the way it isn't." Cronkite's misleading 1968 reportage on the Tet Offensive led critics to blame him for America's defeat in the Vietnam War. "The most trusted man in America" tried (sometimes without success) to shield his left-wing views, "including his odd admiration for global governance." Other "interpretative" or "naive" reporters mentioned by Mr. Kengor as having tipped the scales portside include Dan Rather, Maria Shriver, Peter Jennings, Katie Couric, Don Podesta and Ed Rabel – all of whom, judging by the author's quotes are among those "duped" by Fidel Castro's "prison state" for decades. Herbert Matthew's "New York Times puff pieces lifted Castro from obscurity and made him dictator of Cuba," Mr. Kengor writes. No critique of U.S. journalism should overlook I.F. "Izzy" Stone, who moved for years in pro-communist circles. Mr. Kengor says Stone had a "crush on Castro's comrade, Che Guevara." John Earl Haynes, a respected scholar on Cold War intelligence, says Stone of "I.F. Stone's Weekly" at one time in his journalism career was a Soviet spy. Stone could count on his admiring media colleagues to cover for him when questions arose on his affiliations. This book answers some questions on what is "media bias." Other such explorations will likely follow.